Been out and about again, interviewing the locals. This time round, we are talking goats and goat cheese. How much do you know about goats? Probably not as much as Fabrice Lepoutre. He’s got 100 of them. This is the Berry, and, where there are goats, there is cheese. At his Chevrerie – La Fringale – in between Bourges and Sancerre, Fabrice makes the Crottin de Chavignol – possibly France’s most famous goats cheese, and the only one with the much-prized AOC label. 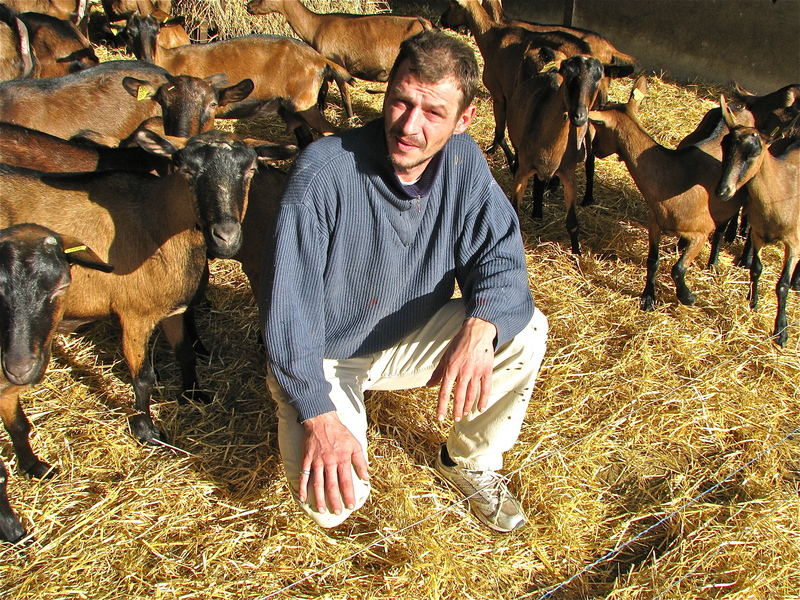 Recently, I went along to meet 41 year-old Fabrice to talk about cheese making and all things “goat”. How did you begin your life with goats? It just happened. First off, I wasn’t even born in the country, and my parents weren’t farmers. As a kid though, I was fascinated by farming, and wanted to work in agriculture. When it came to that time in life where you have to start thinking about studies and qualifications, I opted for Agricultural College. After graduation, I started looking around for a viable agricultural business. Any branch of farming would have done, it just so happens that the first viable business I found was goats. I bought this place in 1997 when the previous owner decided to retire. I have been here ever since. We hear a lot about problems in the farming world. Dairy farmers for example have been enduring very hard times since the scrapping of milk quotas. Can you still make a living in farming? I would say that nowadays, it is almost impossible for young people to get started in agriculture. Modern farms are big businesses that require huge investments. Banks won’t lend money to young farmers, who are setting up new farms. Those coming into farming now are doing so by succession; inheriting family farms or taking over existing and viable concerns. As for those farmers who are going out of business, their land, livestock and machinery is snapped up by other farmers. In this business everyone is always looking to expand and diversify to survive. Is there a living in goats? I make a living. I haven’t got a huge operation; there again, I wouldn’t put myself in the same league as the modern intensive or industrial farmer. I am an artisan. A one-man business with a single product. There is nothing industrial about my means of production; I try to remain as traditional as possible to ensure the quality of my cheese. Does that make you organic? There’s not much sense in organic farming. If we want to produce enough to eat, there’s no point farming the way our ancestors did. We have to mix modern and traditional methods in a common sense way. I suppose if I was truly organic, I’d milk all my goats by hand, but that’s frankly daft when you’ve got 100 of them to milk twice a day. I also regularly add vitamin supplements to the feed. That’s common sense if you want healthy goats. There’s plenty of goat cheese on the supermarket shelves, what is so special about the Crottin de Chavignol? Are there other sorts of Crottin? Sometimes we dress up the cheese. We make a version called a poivré – when the crottin is still young, we’ll coat it in black pepper. There is also the Crottin aux Noix – we’ll roll the young cheese in crushed walnuts. How many crottins do you make a year? I suppose the AOC makes the Crottin de Chavignol a luxury food? In a way. I sell my crottins around the local markets. My starting price is 1.40€. In the cities though, you will be paying upwards of 2€ per crottin, that’s almost the price of a supermarket Camembert. By the time you buy enough crottin for the whole family you’re going to be spending over 6€. People can’t afford that, so crottin is not an everyday cheese, it’s a Sunday lunch thing, or dinner with friends. Mind you, it is an affordable luxury when you compare it with some quality cuts of meat. Well, for the Crottin de Chavignol, we use Alpine goats. They have an average life span of about thirteen years. The female goat or Chevrette will reproduce twice in her life. The gestation period for the female is five months. In milk production terms, because don’t forget, I am running a business; a female goat has a viable five year span. There is fifteen months from birth to full milk producing maturity. Of course during this time you don’t know if your chevrette is going to give good yields or not, so you bring them all on the same way. At full maturity, you have to make a choice. Those goats giving low or poor quality yields have to be sold on. I might just get ten Euros for such a goat. However, if I want to buy in new, healthy, fertile and productive goats to boost the herd, they can cost as much as 350 Euros each. What happens to the goats you have to sell on? In some parts of Southern France, goat is a popular alternative to lamb at Easter. 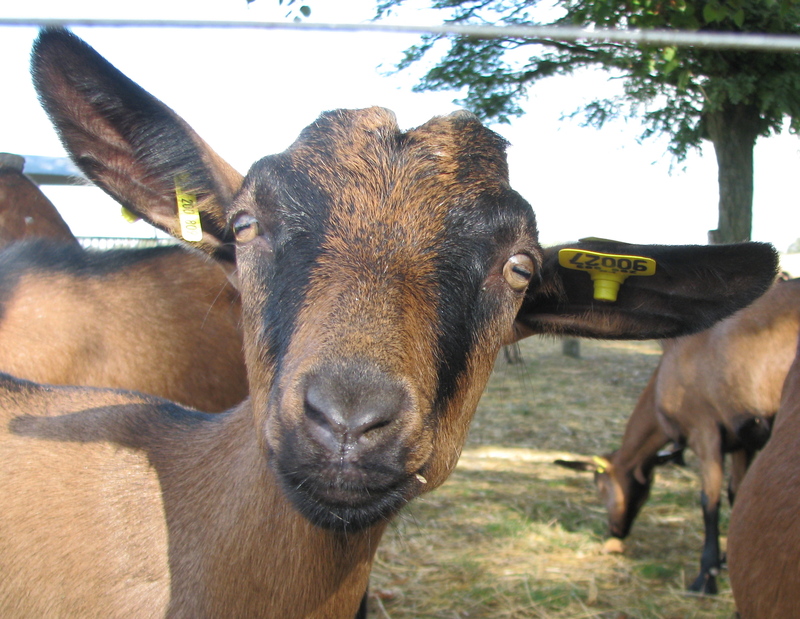 The biggest consumers of goat in the EU are the Greeks and the Portuguese. What’s the best way to eat your crottin? After two days, when the goats milk has curdled, we get a kind of fromage blanc that we call faisselle. This is ladled into individual draining baskets and is ready to eat. You can eat it as a desert, sweetened with sugar, or you can make a fromagée – add onions, chives, echalottes, salt and pepper and a spoonful of fresh cream to the faisselle, chill it in the fridge and it is ready to eat. Great on a baked potato or just on its own. After ten days of maturing, the cheese has officially attained its crottin status, though at this time, it is not hard and no real skin has developed. At this stage we call it crottin frais. You can now eat it any way you like. For me, the only way to eat a crottin is with a good, freshly baked baguette. Round here lots of people eat Crottin Chaud. They grill or heat the cheese, then serve it on bread accompanied by a green salad preferably a Frisée, you can add walnuts and lardons (bacon bits). As for the fully matured cheese, you can grate this onto pasta, just like Parmesan. Whatever way you eat your Crottin, its always best with un bon coup de rouge, preferably a Sancerre. And you thought milk only came from cows. In France, in your local Crémerie or at the supermarket cheese counter, cheese will be strictly divided in chèvre (goat) or vache,(cow) depending on what animal that milk came from. Technically, the milk does not come from the chèvre, the male goat (Buck), but from the chevrette or female goat (Doe). A young goat or kid is a chevreau. The French do not however call kids chevreaux, in popular usage a kid is un gamin or une môme. Kids grow into teenagers, and to show their passage into manhood, some boys might try and grow a small goatee beard or un bouc in French which, is also another name for a male goat. As we know, when you’re a teenager you get the blame for everything, and you often end up as a scapegoat or a bouc émissaire. At the opposite end of the age spectrum, a cantancarous old woman may be referred to as a vieille bique, meaning an old bag. The word bique itself is a nanny goat. For the male of the species whose libido increases with age, we may say in French un vieux cochon or a lecherous old goat. If you get horny at any age, in French you are excité. In such a state you may speak with trembling or quavering voice – chevroter in French, which in goat terms means you are bleating. Finally a word on goat reproduction. When a male goat has done his duty vis-à-vis the female, he has sailli, meaning covered or served. He thus becomes the Sire or male parent. How noble. If a person gets your goat, there are numerous vulgar ways to voice your annoyance, in polite French though you might say il m’enerve. Why the name Crottin? There are several theories. 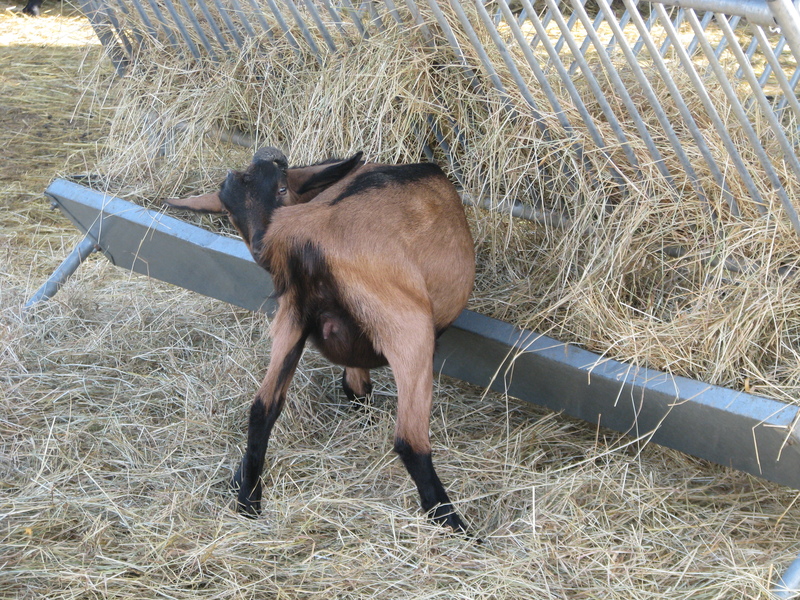 The most popular has to do with goat droppings or crottes (also the general term for any animal droppings). It is suggested that the cheese, when in its most mature form, looks like it has come fresh out the goat, i.e. it looks like goat poo. Another theory is that the word Crot described a small oil lamp made from burned clay, which resembles the mold used to prepare the cheese. The first mention of the Crottin de Chavignol in written local histories dates from 1573. It was during this year, that the Protestants of Sancerre, beseiged by Catholic armies, were obliged to eat all the local goats to survive. Cheese production ceased. The first mention of cheese production in « modern times » comes in 1829, when an affineur in Chavignol was producing and maturing goats cheese. In 1976, the Crottin de Chavignol became the first goat cheese to be atributed the prestigious AOC label. An AOC or Appellation d’origine contrôlée is an official government quality label guaranteeing the comsumer that what he or she is eating or drinking actually comes from where it claims to and that the product is stringently controlled and made according to strict quality procedures. An AOC also guarantees a place in French cultural and gastronomic héritage for the product concerned. There are five distinct steps in the life of a Crottin de Chavignol, though you will find that they can apply to any goat cheese..
Once out the goat, the milk will be left for 48 hours to curdle or cailler. The resulting curds or caille are ladelled into individual draining baskets and salted. At this point, the cheese is known as faisselle a kind of fromage blanc. It takes ten days for the faisselle to mature into a state where it can truly be called a Crottin in terms of the AOC label. At this stage the cheese will be frais. Over the next few weeks, the unique “microclimate” around Chavignol will begin to do its work. A fine blue mould will begin to develop on the cheese. The more mould the better the taste. After three weeks of maturing, the cheese will be Bleuté: At one month the cheese is Bleu moelleux. There is a certain amount of debate between Crottin purists as to when a cheese is blue enough to pass from Bleuté to Bleu Moelleux. Some people even say that both are the same. After two months, the cheese will be dry, crumbly, very blue and exceedinly strong in taste. The cheese is now sec.